The tyres have branding in the moulding. The drive shaft is modelled across the pivot point. 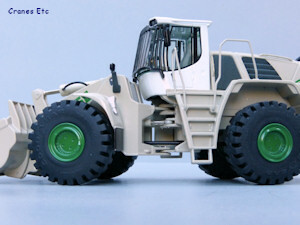 The Liebherr L 586 2plus2 is a large wheel loader with an operating weight of around 31 tonnes. 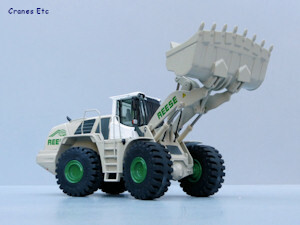 The bucket capacity can be up to 5.5m³ and the tipping load is over 20 tonnes. It has hydrostatic drive technology and is noted for its efficiency and fuel economy. 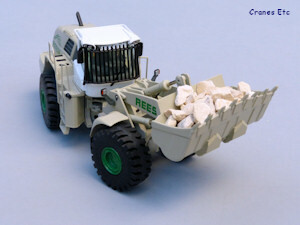 The model configuration reflects a rock quarry application with a protection grille, Good Year rock tyres and 5m³ rock bucket. 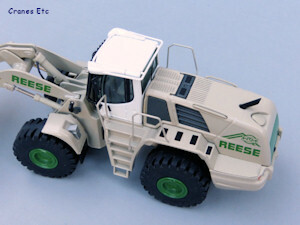 It is in the colours of WRM-Reese, a German family-run aggregates company. 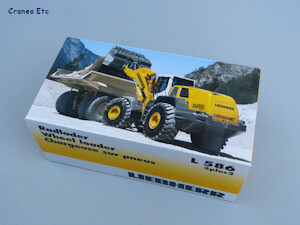 The L 586 comes in a nice Liebherr box. 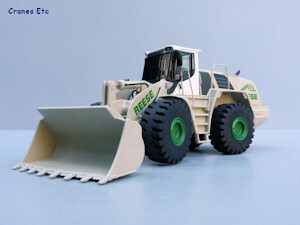 It is unusual for a Liebherr model as it has an opening flap which reveals the model sitting within foam rubber. A simple instruction sheet describes how the debris guard can be fitted and removed from the windscreen, and a couple of wooden pointers are provided to help with the task. Underneath the model, the detail is quite good with prop shafts and differentials modelled. The wheels have very good metal hubs and it is particularly pleasing to see that the heavily treaded tyres have 'Good Year' and the type designation moulded into the side walls. The cab detailing is nice with windscreen wipers and mirrors and the glass is reproduced well inside delicate looking frames. The grab rails around the top of the cab are plastic. The access steps have a textured surface and have excellent fine gauge metal hand rails on each side. The plastic debris guard looks realistic. At the rear the engine cover has some excellent grilles and other details within the casting. The loader arms look authentic and some of the lift cylinders have hydraulic lines running to them although the colour match of the cylinder jackets is a slightly off to the painted metal parts. The bucket is really nice with very good teeth and wear plates. 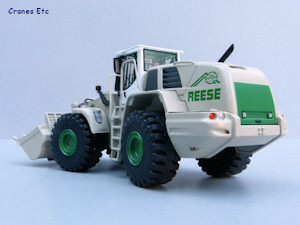 The Reese colour scheme is applied well and the graphics are sharp. The rear axle has significant amount of pivot so it can be posed running over very rough terrain with all tyres grounded. The wheels share a common axle so they tend to turn as pairs. 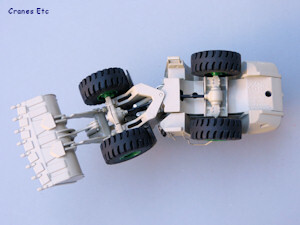 The articulation to allow steering works well and an angle of about 30° can be obtained. 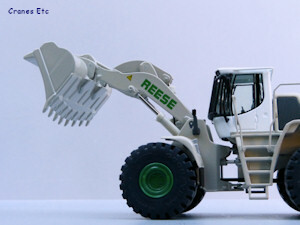 At the front the loader arms can lift the bucket to above the cab height and a good tipping angle can be obtained. The cylinders are stiff and hold any pose set. 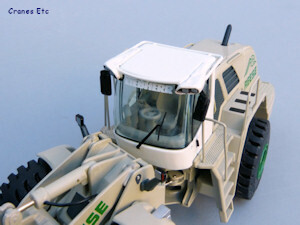 The debris guard on the cab is removable although it was a loose fit on the review model. 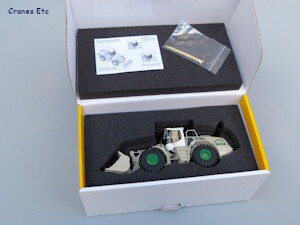 This is a high quality model with few plastic parts. The build quality was slightly below that of previous versions of the L 586 which have been reviewed. The paintwork and graphics are very good. The L 586 is fair value for a limited edition. 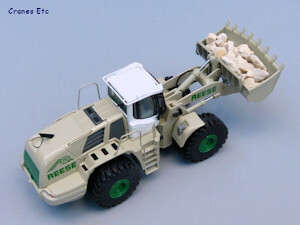 This is a high quality wheel loader from NZG and the Reese colour scheme is an interesting variation. 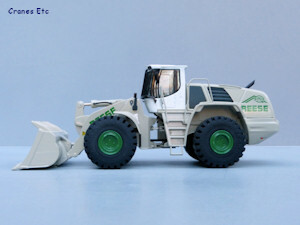 The model was first presented in Liebherr's colours at the Nuremberg Toy Fair in 2008. Many liveries have been produced and this version appeared in a run of 300 models in the Winter 2013. Windscreen with the debris guard removed.